Dental problems are found far and wide in almost every one of us. Dental issues arise due to multiple factors leading to problems with the one or various tooth in the area. Factors like a lack of care, accidents, ill-advised methods that damage teeth, in the long run, are some, but the primary factor is the lack of direct awareness towards conserving the teeth rather than maintaining its appearance. Taking one of the most common elements, a missing tooth, often many patients let it be the way it is, but some go about trying to repair the same using the advice of their dentist. Dentists might provide you with many options, but the best option is to choose something that’s permanent and hassle-free. With ample research, a patient and dentist alike will stumble upon the idea of dental implants, and it sure would be the ideal solution for the problem. There are different steps as well as types of dental implants, which we will look in little details below. 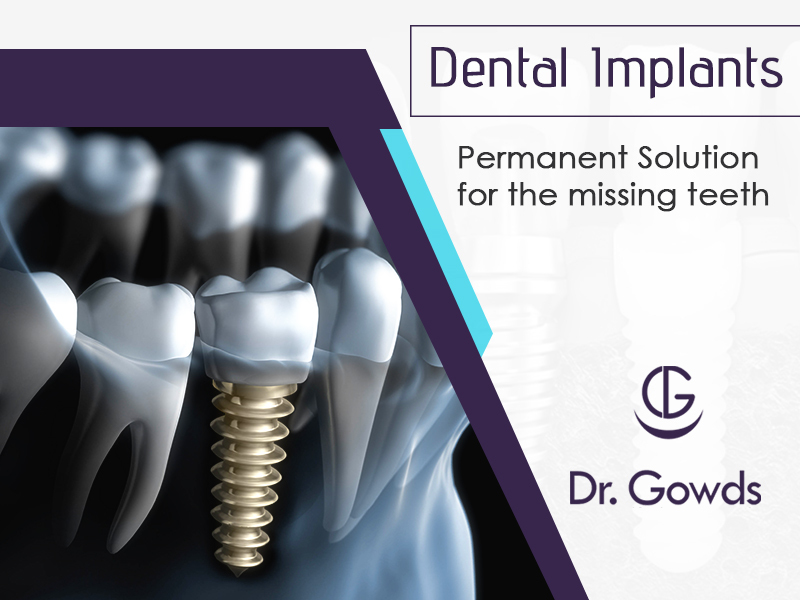 Dental implants are permanent structures that help as complete tooth replacements. There are three components to the process, post, abutment and restoration. The implant itself made out of titanium and integrated into the jawbone and takes the place of the tooth root; it’s more like a screw. Then the top is covered using a crown which replicates teeth and makes it look like one, for the long term. With dental implants, the dentist is the best person to suggest as to which type would be more suited to the patient, depending on various factors. These factors are mostly concerned with the person’s dental frame and jaw bone characteristics. In all, there are about three major types dental implants, all of which are designed to hold the new teeth together for the long term and give the patient the desired solution to their dental problems. Endosteal implants are the most common and by far the strongest among all other types. They are shaped like screws, which are inserted into the jawbone for the firm grip they endorse. Once fitted, the false teeth are then placed on top of it. After the implants are set, the jawbone then requires time to heal. In the end, they turn out with a firm hold, much similar to natural teeth roots. When it comes to costs, these dental implants are on a higher side due to the use of titanium as screws. Patients often ask for alternative metal option as it might be cheaper than titanium, although the use of titanium is due its characteristics which cause less oxidation while also creating a far less reactive environment in the affected/treated area. Most patients are eligible for endosteal implants, although the only criteria here is to have a healthy, stable jawbone, to post the implant. The subperiosteal implants come recommended when it becomes clear that the patient’s jawbone would be unable to provide the sufficient hold for the screw. Subperiosteal implants are placed below the gum and top of the jawbone, if not inside it. In this, once the metal frame gets fitted inside the gum area, attached with a post. Following the procedure, as the gum heals, the structure then becomes more secured and only then will the false teeth be applied to the implant. The Subperiosteal implants are ideal for patients with not so much of a healthy jawbone or in many cases when patients refuse to go into oral surgery required in an endosteal implant procedure. The zygomatic implant type is quite uncommon among patients. Here the implants are no different, but the process sure is complicated. The Zygomatic implant method is implemented on patients who do not have enough jawbone for endosteal implants, and instead, the cheekbone is used as the base for the implant. Are implants safe and effective in the long run? As far as safety is concerned, yes dental implants are very safe. An experienced dentist will recommend the same, as the implants made with titanium are compatible with the body and have a minimal or no oxidation process, which might become a complication with other metals. In most cases, the implants get accepted by the body. Its effectiveness has never been in question, as the robust and sturdy nature of the implants provides a strong foundation for the false teeth. As for the duration of those implants, they are a long-term investment, lasting, in most cases for a lifetime. In fact, if it does not last a lifetime, it certainly will last for a minimum of 15 years from the time of the procedure. M.D.S. (Osm), F.I.C.D, (USA), FICOI, DICOI, FBDZI, FDGOI. Doctor T. Shankar is the Chief Cosmetic Dental Implantologist, Oral & Maxillo-facial Prosthodontics, Founder Member & Director at School of Dental Implants. Known for understanding the pulse of the patient Doctor Shankar has specialised in Oral and Maxillofacial Prosthodontics and his experience of 15 years in the field speaks for his work as does his patients. At Dr. Gowds Dental Hospital in Hyderabad, you will experience what we consider comprehensive and committed approach to dental health. With over 40 years of experience in general and specialized dentistry, we offer quality dental healthcare that is the best in the industry. The hospital boasts of Dental Surgeons with specialized skills and leading technicians who work with state-of-the-art equipment to ensure best possible range of treatments along with advanced utilization of technology. We are the first to introduce Dental Lasers, Cosmetic Dentistry, Dental Implantsand Immediate Implants to the State in 1967. We are the Pioneers in Dentistry or Dental Care.